Concussion is a 2015 American biographical sports drama film directed and written by Peter Landesman, based on the exposé "Game Brain" by Jeanne Marie Laskas, published in 2009 by GQ magazine. 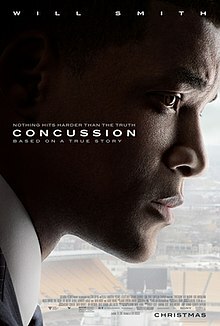 Set in 2002, the film stars Will Smith as Dr. Bennet Omalu, a forensic pathologist who fights against the National Football League trying to suppress his research on chronic traumatic encephalopathy (CTE) brain degeneration suffered by professional football players. It also stars Alec Baldwin, Gugu Mbatha-Raw, and Albert Brooks. The film premiered at AFI Fest on November 11, 2015 and was released by Columbia Pictures on December 25, 2015. The film grossed $48 million worldwide and received mixed reviews, although Smith earned a Golden Globe nomination. Steelers center Mike Webster is found dead in his pickup truck, after years of self-mutilation and homelessness. Before his death, a fellow football player, Justin Strzelczyk, comes to him, and confides that he is starting to lose his memory, that he is saying odd things to his children, and nearly threw his wife against the wall. A disoriented Webster brushes the worries off, and deliriously tells him that the most important thing "is to finish the game," which is what he said during his Hall of Fame speech. Bennet Omalu, a forensic pathologist with the Allegheny County, Pennsylvania coroner's office, handles Webster's autopsy. He wonders how a man, otherwise healthy, and fairly young, could have degenerated so quickly, and makes it a point to figure out why he died of a heart attack at only fifty. Omalu closely examines microscope slides of Webster's brain and discovers that he had severe brain damage. He ultimately determines that Webster died as a result of the long-term effects of repeated blows to the head, a disorder he later calls chronic traumatic encephalopathy (CTE). With the help of former Steelers team doctor Julian Bailes, fellow neurologist Steven T. DeKosky and county coroner Cyril Wecht, Omalu publishes a paper on his findings, which is initially dismissed by the NFL. Over the next few years, Omalu discovers that three other former NFL players, Strzelczyk (died 2004), Terry Long (died 2005), and Andre Waters (died 2006), had symptoms very similar to Webster's. He finally persuades newly appointed NFL commissioner Roger Goodell to allow him to present his findings before a committee on player safety. However, the NFL does not take him seriously, and he is barred from the committee meeting, forcing Bailes, a former NFL employee, to give the presentation in his place. However, the meeting is a set up, where the NFL claims that the players' head trauma was due to past injuries, having nothing to do with football. As he leaves the meeting, former NFL Players Association executive Dave Duerson angrily confronts Omalu and tells him to "go back to Africa." Omalu is subjected to considerable pressure to back down from his efforts, as football is a widely beloved sport in Pittsburgh, having provided jobs and allowed men to go to college. Wecht is subjected to a politically motivated prosecution on corruption charges, and Omalu is forced to leave Pittsburgh soon after, lest he be deported, or sent to prison on petty charges as punishment for tarnishing the NFL. Before leaving he urges the NFL to tell the truth. Omalu's wife, Prema, suffers a miscarriage after being stalked. The Omalus are forced to leave their dream home outside Pittsburgh. They move to Lodi, California, where Omalu takes a job with the San Joaquin County coroner's office. Three years later, Omalu is vindicated when Duerson commits suicide due to growing cognitive problems. In his suicide note, Duerson admits that Omalu was right, and offers his own remains for research. Omalu is allowed to address an NFLPA conference on concussions and CTE. He informs them that he once wished he had never known Mike Webster, but by knowing him, he has the responsibility to inform NFL players of the true risks that they take by playing. He says that he holds no resentment for the NFL and tells them to forgive themselves and be at peace. Amid growing scrutiny from Congress, the NFL is forced to take the concussion issue more seriously, and in 2011, NFL players sue the league for not properly informing them of the risk of CTE. Omalu is offered a job as chief medical examiner for the District of Columbia, but as explained in closing title cards, turns it down, remaining with Prema and their two children in California, where he became a U.S. citizen in February 2015. A final montage includes reports of Junior Seau's suicide in 2012, and the subsequent lawsuit brought by players. Ridley Scott's idea of an NFL concussion film was inspired by Dr. Bennett Omalu's study about former NFL stars Junior Seau and Dave Duerson, both of whom committed suicide after suffering from chronic traumatic encephalopathy (CTE). Scott was set to direct after his film Exodus: Gods and Kings, while he and Facio were looking for an A-list writer. In November and December 2013, two more NFL concussion films were in development, first Game Time Decision with writer/director and former NFL training camp attendee wide receiver Matthew A. Cherry and actor Isaiah Washington, and another film League of Denial with producers Walter Parkes and Laurie MacDonald. Landesman had based his script on the 2009 GQ article Game Brain by Jeanne Marie Laskas. Smith and Marsan previously appeared together in the 2008 superhero film Hancock. It received $14.4 million in film tax credits from Pennsylvania. Principal photography started on October 27, 2014, in Pittsburgh, Pennsylvania, and filmed there through mid-January. One of the film's key scenes was shot in Altius Restaurant in the Mt. Washington section of Pittsburgh. Other area scenes were shot at a church in Pittsburgh's Hill District, the Braddock Carnegie Library, and in downtown Pittsburgh. James Newton Howard composed the score for the film. Klayton (frontman of Celldweller) provided synth programming for the score. R&B singer Leon Bridges provided a new song, called "So Long". The first trailer was released on YouTube on August 31, 2015 by Sony Pictures Entertainment. Sony released the film on December 25, 2015. Marketing included advertisements for the film airing during NFL games. Concussion was released on Digital HD on March 15, 2016, before being released two weeks later on DVD, Blu-ray and 4K Ultra HD on March 29, 2016. Concussion grossed $34.5 million in North America and $14.1 million in other territories for a worldwide total of $48.6 million, against a budget of $35 million. In the United States and Canada, the film opened on December 25, 2015 alongside Daddy's Home, Joy, Point Break and the nationwide expansion of The Big Short. In its opening weekend, the film was projected to gross $8–10 million from 2,841 theaters. It eventually grossed $10.5 million, finishing 7th at the box office. Due to Smith's star status and the $35 million production budget, the film was considered a box office disappointment. On Rotten Tomatoes, the film has an approval rating of 59% based on 193 reviews, with an average rating of 6.1/10. The website's critical consensus reads, "Concussion lands a solid, well-acted hit on its impressively timely subject matter, even if its traditional, sports drama structure is a little too safe to deserve a full-on dance in the end zone." On Metacritic, the film has a score of 55 out of 100, based on 39 critics, indicating "mixed or average reviews". On CinemaScore, audiences gave the film an average grade of "A" on an A+ to F scale. Will Smith's performance was praised for being "sensitive [and] understated" by The Denver Post. Alec Baldwin's performance was well-received, although his accent was criticized. Family members of Dave Duerson, a former NFL player who suffered from CTE (chronic traumatic encephalopathy) and commited suicide, claimed the film portrayed Duerson in a bad light. In one scene, Duerson's character called Omalu's character a "quack" in addition to telling him "to go back to Africa" and "get away from our game." In another scene, Duerson is shown mocking former NFL player Andre Waters when he filed an application for benefits in connection with head injuries he sustained while playing in the NFL. Duerson's family members called these scenes false. In response, Landesman, the film's director, stated that the film was "emotionally and spiritually accurate all the way through". When asked about the accuracy of the film, Steven DeKosky also noted that it took numerous liberties. Slate science writer Daniel Engber, who has been skeptical of the link between CTE and the deaths of players found to have had it, called the film inaccurate in other ways, for example suggesting that Wecht's arrest on corruption charges was motivated by Omalu's paper, when in fact it was published three months afterwards. "[The film] feeds into a pervasive myth at the center of the national discussion over football and head injuries," he charges. In particular, he cites a 2012 National Institute for Occupational Safety and Health study indicating that football players, on average compared to the population as a whole, live longer and generally healthier lives, though the study also indicates, as Engber concedes, that former football players are also more likely to suffer, and die, from neurodegenerative disease. More recent research and thinking also looks at the steady accumulation of subconcussive blows, in addition to symptomatic concussions, as a major contribution factor in the development of CTE. For example, a 2018 study found that each year an athlete played tackle football before age 12 predicted earlier onset of CTE symptoms by an average of two-and-a half-years, but not symptom severity. These CTE symptoms include cognitive, behavioral, and mood problems. After comparing the script (from the Sony Pictures hack) with the released movie, Deadspin claimed the movie was edited to appease the NFL, including reducing prominence of Roger Goodell and Paul Tagliabue in the film, as well as changing or removing dialogue. The New York Times discovered emails directly referencing removing "unflattering moments for the NFL” and removing “most of the bite” out of the film “for legal reasons with the NFL". Landesman stated the changes were made "to portray the characters and story as accurately as possible to reduce the chance that the league could attack the filmmakers for taking too much creative license". ^ a b c Busch, Anita (September 30, 2015). "'Concussion' To Get World Premiere At AFI Fest". Deadline Hollywood. Penske Business Media. Retrieved February 8, 2017. ^ "CONCUSSION (12A)". British Board of Film Classification. November 2, 2015. Retrieved November 2, 2015. ^ McDonald, Adrian (June 15, 2016). "2015 Feature Film Study" (PDF). Film L.A. Archived from the original (PDF) on August 10, 2017. Retrieved June 16, 2016. ^ a b c "Concussion". Box Office Mojo. IMDb. Retrieved August 21, 2016. ^ Laskas, Jeanne Marie (September 14, 2009). "Bennet Omalu, Concussions, and the NFL: How One Doctor Changed Football Forever". GQ. Condé Nast. Retrieved February 17, 2016. ^ Fleming, Mike Jr. (November 7, 2013). "Ridley Scott To Direct Film About Deadly Effects Of Concussions In Football Players". Deadline Hollywood. Penske Business Media. Retrieved October 12, 2014. ^ Fleming, Mike Jr. (November 13, 2013). "Isaiah Washington, Matthew Cherry Huddle On Football Concussion Pic". Deadline Hollywood. Penske Business Media. Retrieved October 12, 2014. ^ Fleming, Mike Jr. (December 9, 2013). "A Collision Of Football Concussion Projects: Parkes/MacDonald Options NFL Head Injury Expose 'League Of Denial' For Pic". Deadline Hollywood. Penske Business Media. Retrieved October 12, 2014. ^ Fleming, Mike Jr. (June 3, 2014). "Will Smith Eyeing Gridiron Concussion Pic At Sony With Peter Landesman Directing". Deadline Hollywood. Penske Business Media. Retrieved October 12, 2014. ^ Pittsburgh Post-Gazette (December 4, 2014). "The Will Smith crew filmed at Braddock Carnegie Library this week". Pittsburgh Post-Gazette. PG Publishing. Retrieved July 11, 2018. ^ Vancheri, Barbara (October 31, 2014). "Will Smith football movie shooting in Pittsburgh". Pittsburgh Post-Gazette. PG Publishing. Retrieved July 11, 2018. ^ Klayton (August 31, 2015). "By now, most of you have heard that there's a new Will Smith movie called "Concussion" coming out. Some of you probably know that it's being scored by James Newton Howard". Celldweller official page. Facebook. Retrieved August 31, 2015. ^ Tapley, Kristopher (October 19, 2015). "'Concussion': Leon Bridges Writes Song for Will Smith Drama". Variety. Penske Business Media. Retrieved July 11, 2018. ^ Sony Pictures Entertainment (August 31, 2015). "Concussion - Official Trailer (2015) - Will Smith". YouTube. Retrieved August 31, 2015. ^ McNary, Dave (January 27, 2015). "Will Smith's 'Concussion' Drama Set for Christmas Release". Variety. Penske Business Media. Retrieved January 28, 2015. ^ Chase, Chris (November 26, 2015). "The NFL-shaming 'Concussion' aired a commercial during Thanksgiving game". USA Today. Gannett Company. Retrieved December 2, 2015. ^ "Concussion (2015)". DVDs Release Dates. Retrieved February 9, 2016. ^ D'Alessandro, Anthony (December 21, 2015). "'Force Awakens' Will Own Christmas Weekend As Five Wide Releases Join The Fray – Box Office Preview". Deadline Hollywood. Penske Business Media. Retrieved December 23, 2015. ^ a b D'Alessandro, Anthony; Busch, Anita (December 28, 2015). "'Daddy', 'Joy' & 'Hateful Eight' Reap Fortune As 'Star Wars' Halo Effect Impacts B.O... Can 'Force Awakens' Hit $1 Billion In U.S.?". Deadline Hollywood. Penske Business Media. Retrieved July 11, 2018. ^ Obenson, Tambay (January 11, 2016). "'Concussion' adds to Will Smith's recent list of box office disappointments. What's going on?". IndieWire. Penske Business Media. Retrieved February 9, 2016. ^ Mendez, Eduardo (December 26, 2015). "Concussion Movie Update: Low box office numbers prove people aren't really concerned about CTE". Sports World News. Retrieved February 9, 2016. ^ "Concussion (2015)". Rotten Tomatoes. Fandango Media. Retrieved December 31, 2018. ^ "Concussion Reviews". Metacritic. CBS Interactive. Retrieved February 12, 2016. ^ The Associated Press (December 25, 2015). ""Concussion" movie review: A sensitive Will Smith anchors film that hits home". The Denver Post. Digital First Media. Retrieved January 20, 2016. ^ "Nominees". 47th NACCP Image Awards. NAACP Image Awards. Archived from the original on August 28, 2016. ^ a b Belson, Ken (December 16, 2015). "Dave Duerson's Family Says 'Concussion' Film Smears Him". The New York Times. The New York Times Company. Retrieved December 17, 2015. ^ "'The Great DeKosky' Talks CTE & Concussion". www.medpagetoday.com. January 14, 2016. ^ Engber, Daniel (May 9, 2012). "The Concussion Panic". Slate. The Slate Group. Retrieved April 22, 2016. ^ a b Engber, Daniel (December 21, 2015). "Concussion Lies". Slate. The Slate Group. Retrieved December 26, 2015. ^ Baron, Sherry L.; Hein, Misty J.; Lehman, Everett; Gersic, Christine M. (March 15, 2012). "Body Mass Index, Playing Position, Race, and the Cardiovascular Mortality of Retired Professional Football Players". American Journal of Cardiology. 109 (6): 889–896. doi:10.1016/j.amjcard.2011.10.050. PMID 22284915. Retrieved December 26, 2015. ^ Hits, Not Concussions, Cause CTE, Boston University School of Public, Jan. 18, 2018. ^ We Know Football Is Dangerous. So Why Are We Still Letting Our Sons Play It?, Men's Health, Andrew Lawrence, July 10, 2018. ^ Age of First Exposure to Tackle Football and Chronic Traumatic Encephalopathy, Annals of Neurology, Michael L. Alosco PhD, Jesse Mez MD, MS, et al., April 30, 2018. ^ Burke, Timothy. "How Sony Changed Concussion To Make The NFL (Or Their Lawyers) Happy". Deadspin. ^ Wagner, Kyle. "The NFL Didn't Have To Screw Will Smith's Concussion Movie, Hollywood Already Had". Deadspin. ^ Belson, Ken (September 1, 2015). "Sony Altered 'Concussion' Film to Prevent N.F.L. Protests, Emails Show" – via NYTimes.com. ^ Wagner, Kyle. "Here's An Impossibly Stupid Scene That Was Cut From The Concussion Movie". Deadspin.